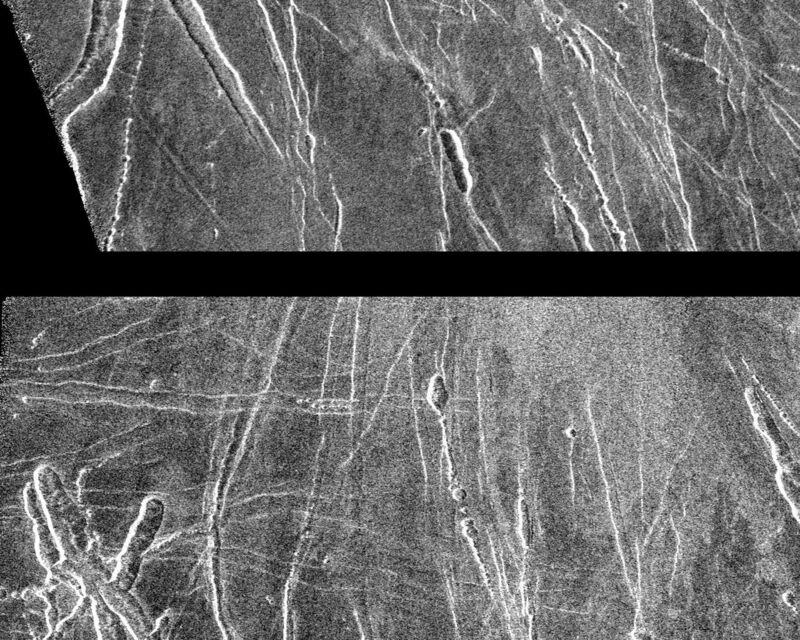 These two Magellan radar images are centered about 60.5 degrees south latitude and 348.8 degrees east longitude in the eastern Lavinia Region of Venus. The images, which are 110 kilometers (68 miles) in length and 130 kilometers (81 miles) in width, are full resolution mosaics of 14 orbits. 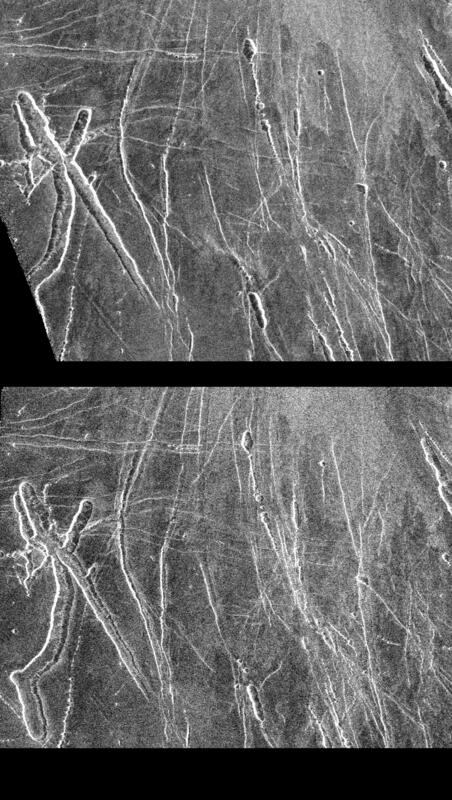 The bottom image was made during cycle 2 of the Magellan mission when the radar was looking to the right of the spacecraft and at an angle of 25 degrees. The top image was made at the beginning of the mission when the radar was looking to the left and at an angle of 20 degrees. The mission data at the lower left of the top image represents the beginning of radar mapping during cycle 1. Both images show an area with interesting troughs, which are collapse features. In the bottom image, the north-south trending trough has a bright side on the left and a darkside on the right, while in the top image it is reversed. This is because the side of the trough sloping away from the radar appears dark while the side facing the radar appears bright. 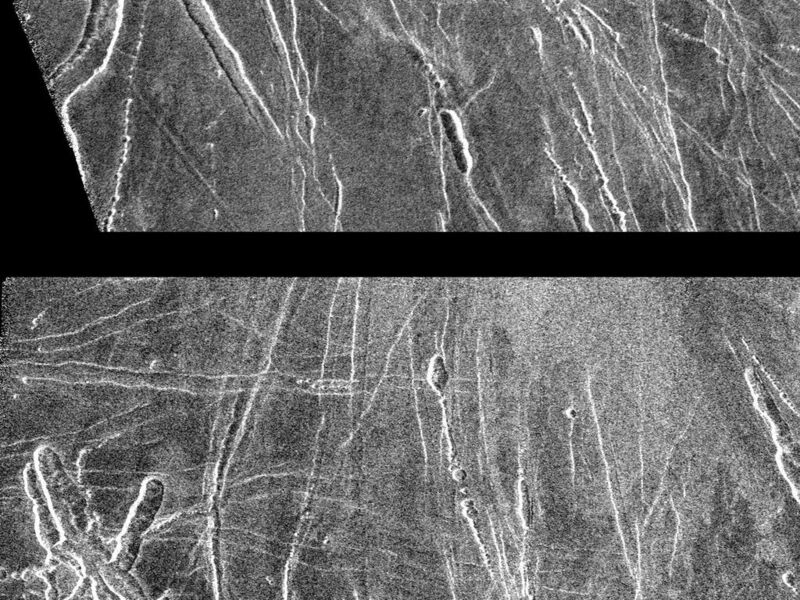 Since the radar was looking from the right in the bottom image and from the left in the second image, the bright and dark sides for the trough are reversed between the top and bottom images. It is very useful to obtain right-looking and left-looking images of the same area because features may not be visible from the opposite look direction. 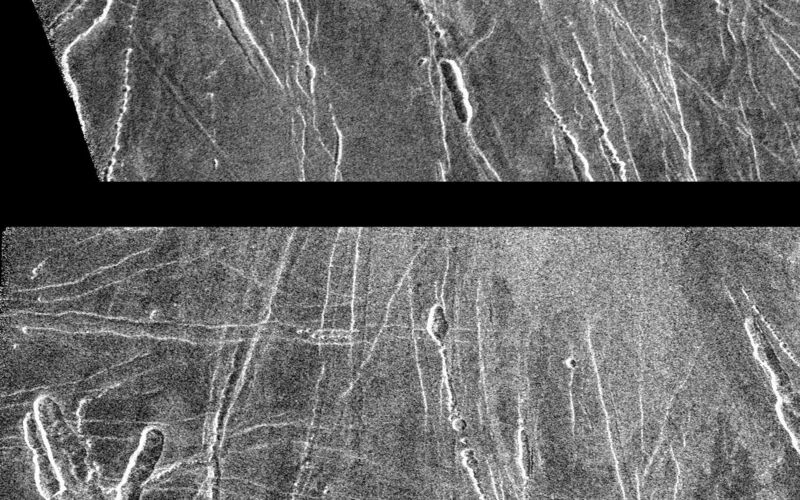 For instance, there are some fractures that can only be seen in one image. In addition, the different incidence angles obtained in cycle 2 of the mission, will allow scientists to better understand the nature of the Venus surface. Resolution of the Magellan data is about 120 meters (400 feet).